I made the wreath pictured four years ago. It has hung on my front door every year, in the full sun, and has just this year begun to show signs of fading. I got the idea from a magazine (can't remember which one), and altered the design to fit my own taste. Measure wreath into thirds, mark. Leaving one third blank, measure and mark at approximately 2" intervals on remaining two thirds. Set aside. Cut all fabric into 2" sqaures. Using orangewood stick, or pencil, drape one square of fabric over the end. 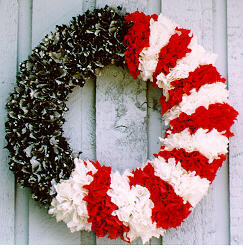 Dip into glue, and insert into wreath. Continue with each color, filling marked areas according to photo. Determine hanger position, and attach paper clip to back by inserting into straw.